And ye shall offer up unto me no more the shedding of blood; yea, your sacrifices and your burnt offerings shall be done away, for I will accept none of your sacrifices and your burnt offerings. And ye shall offer for a sacrifice unto me a broken heart and a contrite spirit. And whoso cometh unto me with a broken heart and a contrite spirit, him will I baptize with fire and with the Holy Ghost (3 Nephi 9:19–20). If this was a new standard instituted by the Savior after his death, then how did Lehi know about it and expect his people to live by it even though they still lived the Law of Moses and offered animal sacrifices? The idea of offering a sacrifice of a “broken heart and contrite spirit” is rare in the Old Testament and does not appear in the New Testament at all. The idea that this teaching came directly from Jesus is unique to 3 Nephi. Just as the doctrines of faith in Christ, repentance, and baptism by water and by the Spirit were taught from the time humans first lived on the earth, so likewise the law of sacrifice was introduced to Adam and Eve at their expulsion from Eden (Moses 4:27). 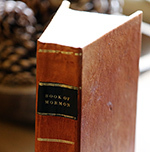 … Latter-day Saints therefore accept that just as faith, repentance, obedience, and other gospel requirements were necessary to qualify for the salvation prior to Jesus’s mortal ministry, the requirement that premeridian disciples of the Lord participate in all aspects of the law of sacrifice with heartfelt devotion was also expected by the Lord throughout those earlier millennia; it was not something originally announced to Nephite survivors when the Son of God concluded his saving mission. The two principal examples that he cites come from the Psalms. Although the doctrine of sacrificing “a broken heart and a contrite spirit” does not appear explicitly in the New Testament, many would expect this would be a doctrine that could only be introduced in the Christian era and may find fault with the Book of Mormon for putting the notion in the mouth of the seventh century BC prophet Lehi. However, as Professor Dana Pike has demonstrated, this concept, although rare, is found in the Old Testament, specifically in passages from the Psalms that likely predate the time of Lehi. This provides evidence to support the notion that Lehi and his descendants could have been aware of the requirement to sacrifice “a broken heart and a contrite spirit” along with their animal sacrifices. Furthermore, it demonstrates that the more spiritual type of sacrifice was what was truly important, especially because the typological animal sacrifices would be done away with when the Messiah came to perform the true and infinite atoning sacrifice. This presents an important lesson for modern Book of Mormon readers. No matter what sacrifice we offer to the Lord—be it our time, our talents, etc. —If this is not done with the true sacrifice of our hearts and spirits, then it cannot be fully acceptable to the Lord. Dana M. Pike, “3 Nephi 9:19-20: The Offering of a Broken Heart,” in Third Nephi: An Incomparable Scripture, Andrew C. Skinner and Gaye Strathearn, eds. (Provo, Ut. : Maxwell Institute; Salt Lake City, Ut. : Deseret Book, 2012), 35-56. See also 2 Nephi 4:32 and Jacob 2:10. Jesus does present the same idea in later periods: to Moroni in Ether 4:15 and to Joseph Smith in D&C 59:8. Dana M. Pike, “3 Nephi 9:19-20: The Offering of a Broken Heart,” in Third Nephi: An Incomparable Scripture, Andrew C. Skinner and Gaye Strathearn, eds. (Provo, Ut. : Maxwell Institute; Salt Lake City, Ut. : Deseret Book, 2012), 42-43. Outside of the Psalms, the terms “broken heart and a contrite spirit” are almost exclusive to the Book of Mormon and other latter-day scripture. D. Todd Christofferson, “When Thou Art Converted,” Ensign, May 2004, 12. Those particular terms "a broken heart and contrite spirit" are not used often except in modern and other scriptures Prophet Joseph brought to light, but I think it is not uncommon to find the basic tenet spoken of differently or with words such as "perfect heart and a willing mind" from Kings. "Broken" and "contrite" heart seem the clearest to me but perhaps not to everybody. I'm sure the enemies of Israel plucked these basic ideas out many times. Am I right on this?